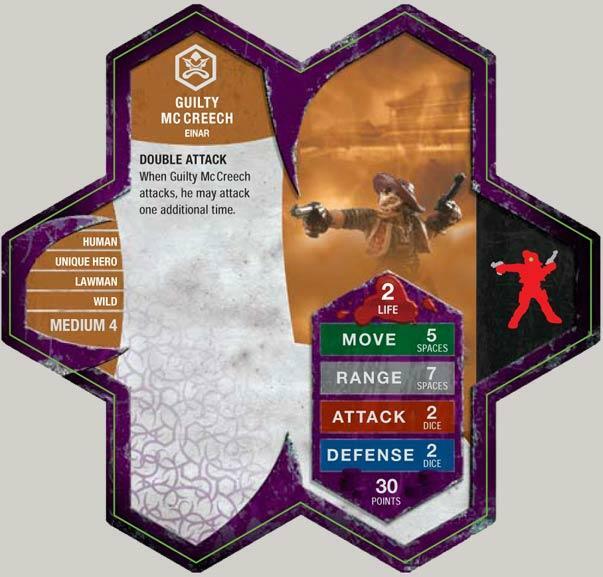 How does Guilty McCreech's Double Attack work? Does he have to attack the same opponent? As a Human who follows Einar, Guilty McCreech may benefit from Count Raymond's MANEUVER 9 ability. As a Wild Human Hero, Guilty McCreech may benefit from Dreadgul Raider's bonding bonus. As a Unique Human, a destroyed Ebon Armor you control may be placed on Guilty McCreech's Army Card to replace Guilty McCreech upon his own destruction. Filler units are great. Guilty and Eldgrim get picked a LOT in our games. I hope they get some 30 point or less company soon. Guilty costs so cheap because of his low life. In the games I've used him in he often dies quickly. I just use him as a filler for my army. You are dead wrong on this one, and I'm sorry to be so direct but I had to be. One more unique (squad or hero) to consider vs. Syvarris is Guilty. It is worth 30% what Syvarris is worth. However, it has the same defense with 50% the lives and 66.67% the attack on the ground and 75% the attack with height advantage. Syvarris's awsome range is the only thing that gets close to explaining why it is worth 3.33 times one Guilty, and it falls short. Guilty has 77.78% the range of Syvarris (or Syvarris has 1.29 the range of Guilty). None of the stats. justify Syvarris' value of 3.33 times more over Guilty. Guilty is clearly undervalued when compared to Syvarris on all stats, and could be worth up to 40+ points when compared to Syvarris. In other words, if you got 100 points to fill in and need range like stated above, hire Guilty and use the other 70 points to boost some common squads or whatever else. You would still be able to spend 70 points in other units such as a whole squad of 4th Mass or Aubrien Archers or Tagagwa Samurai Archers for instance. I lost a large chunk of my army last Saturday just against Guilty and I was wondering why a 30 points unit got me so bad. I made many bad moves but such a disproportionate outcome is partially explained by luck and partially by Guility's strong stats. for 30 points. Don't forget Syvarris is an Ullar Elf and gets many bonuses that Guilty could never have. Stats are more of a sliding scale, not a 1 for 1 deal. A defense die isn't worth X number of points and lived are not worth X number of points each. Guilty is 30 points with 2 life and 2 defense. That in no way means a figure with 6 life and 6 defense is worth 90 points; it would be much more than that. Syvarris has greater range and more life, he should be able to stay on the fringe better with his range and survive a bit longer because of his life. As similar as the units are, it isn't as easy as saying Syvarris is 3.3 times the point value so he should have 3.3 times the stats. It doesn't work that way. Exactly. The difference between 7 range and 9 range is huge. Plus, even discounting Syvarris' range advantage, according to the matchup calculator Syvarris has a 93.4% chance of winning against Guilty. This suggests that Syvarris should be worth significantly more than Guilty. You are right. I know it does not work that way "strictly" speaking, but there is definitely a strong positive correlation with the stats. One example is Syvarris = 100, Kaemon = 120 and Q10 = 150. You could argue back and forth about points but the order of value is clear to me under most circumstances for those three without a doubt. It is supported by an undeniable positive correlation in the stats. Otherwise, it would just not make sense. My goal was to illustrate how awsome Guilty is for his cost compared to a much more expensive alternative. I have no doubt that you get more value per point with Guilty under most realistic scenarios than with Syvarris and you can add a whole other squad or range units. Try to take on any of those three combinations: Tagawa Archers + Guilty, 4th Mass + Guilty or Aubrien Archers + Guilty, and play it against Syvarris. I have no doubt of who would prevail under most realistic circumstances. Of course, it depends on luck as in die rolls and order of turns, but the odds are against Syvarris no doubt. Don't get me wrong. I like Syvarris and he has the advantage of forcing other units stay away or move forward..., but under most scenarios, he would most likely be owned by any of the aforementioned three alternatives. In fact, a couple of squads of no defense Venoc Vipers worth 80 can get to him and finish him off. The 4th Mass alone is 4X4 with wait and fire and height advantage. Of course, the 4th Mass will have to either move away and hide or sneak in forward, which most likely will cost some lives and loose the wait then fire and height advantage in the process. But if Syvarris losses his only advantage, namely distance, and this is likely to happen. He is going down. If the map was infinitely large, Syvarris would rule the nest, but it is not. Either the bumps on the edge or crosses the line into another army if there are more than two players. Again, I have nothing against Syvarris, but to make a long story short. Guilty is more than worth his own weight in gold. That's the bottom line of my point. Pfft. Just a filler unit. Not a threat at all. IF he gets on height, he'll only last one turn. He doesn't warrant an order marker unless he's one of your last figures left, like most fillers. I'd rather pick marcu and isamu.